A pumpkin very popular in Japan. 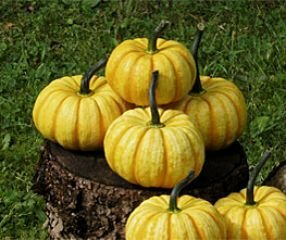 Measuring six to eight inches in diameter Mini Tiger pumpkins have a classic yet squat pumpkin shape. Mandan or Yellow Mandan squash was introduced commercially in 1912 by the seed firm of Oscar H. Will & Company of Bismark, North Dakota. That strain was white, oblate in shape, and yielded fruit weighing 3 to 4 pounds on plants generally described as �bush,� even though they sent out vines of considerable length. 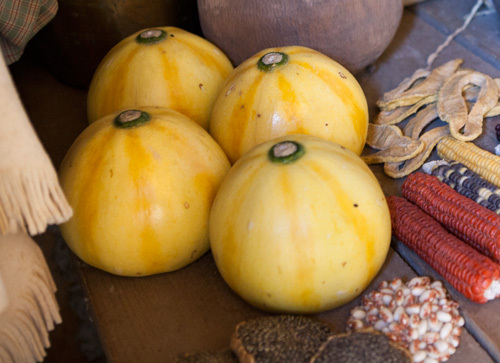 In any case, the squash was said to originate among the Mandan Indians of the northern Great Plains, hence the name. In fact, Mandan appears to be a variant form of several similar North American squashes of great age. No one has effectively pinpointed their true origin. The white-skinned Mandan of Will & Company became a well-known commercial variety, more round in shape than the yellow variety that I grow. Its creamy skin is dappled with deep forest green between green stripes. 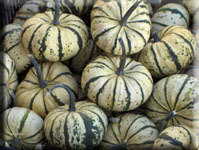 The flesh is a pale lime-white and makes an excellent summer squash when harvested young. 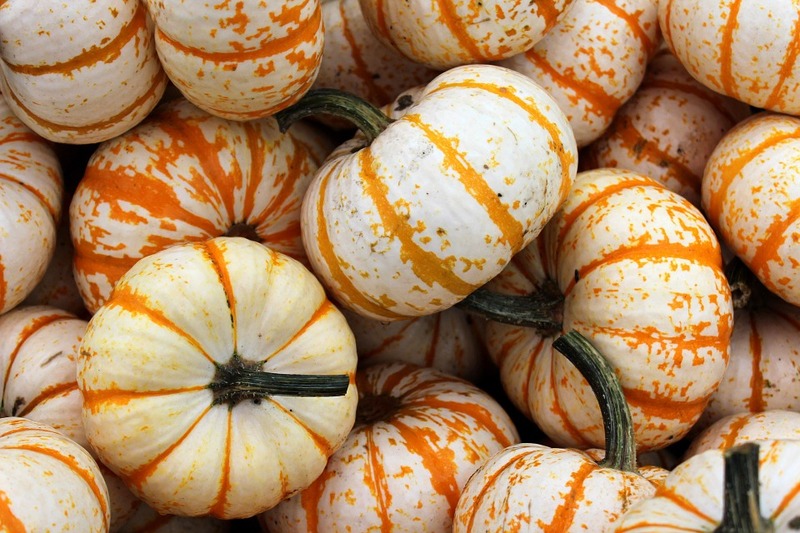 The authors of The Vegetables of New York: The Cucurbits (1937, 201) remarked that White Mandan was similar to two old Eastern squashes: Long Island White Bush, and Green Striped Bergen, the latter introduced commercially in 1841. Because of its bell-like shape, I have always assumed that my Yellow Mandan is actually a selection of Green Striped Bergen by another name. There are several reasons to support this, nineteenth-century iconographic sources aside. The Yellow Mandan is not a yellow White Mandan. 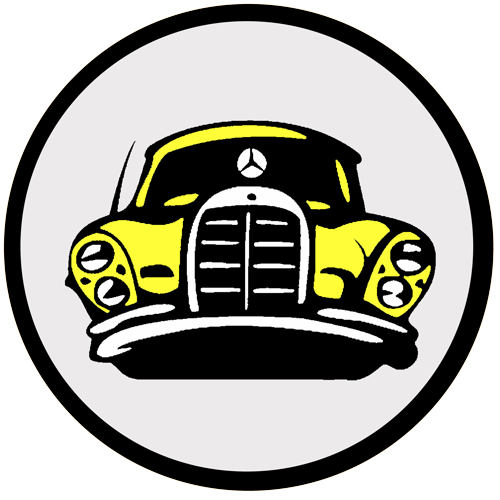 The flesh of the yellow is either pale orange or golden yellow (depending on soil), and the skin is a creamy yellow where the white is �sea foam white,� an old term for white with a tinge of green. 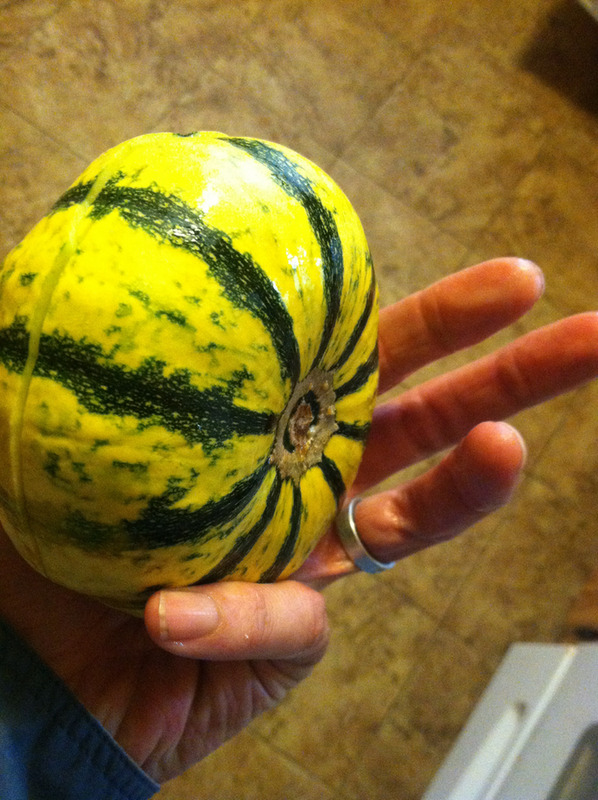 Furthermore, the fruits of the yellow are smaller, weighing 1 1/2 to 2 pounds, or just about half of what one would expect of a true White Mandan. The yellow is also more fragrant when ripe and stores better. It can be pared, seeded, sliced like an apple, and dried. 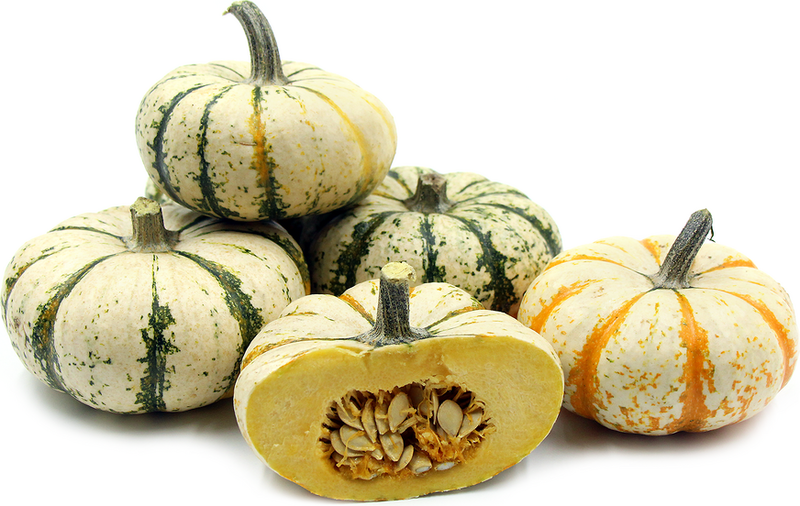 Varietal distinctions aside, only Mandan and Yellow Mandan are presently available through Seed Savers Exchange; the others have vanished from seed lists altogether. 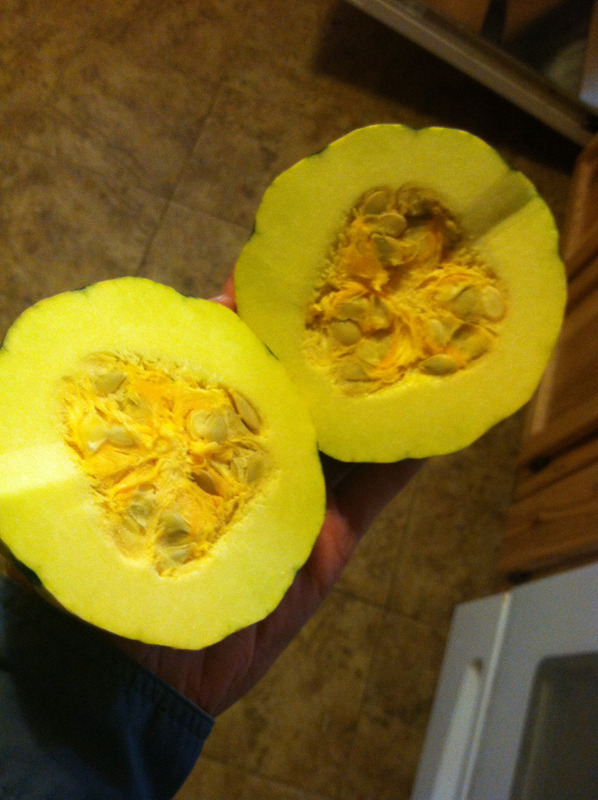 It is an excellent squash for small gardens. The leaves resemble large grape leaves, and they hug the ground so that the vines do not compete with taller vegetables nearby. Thus, it thrives under the protection of corn or around the base of staked tomatoes. More important, the plants produce abundantly. 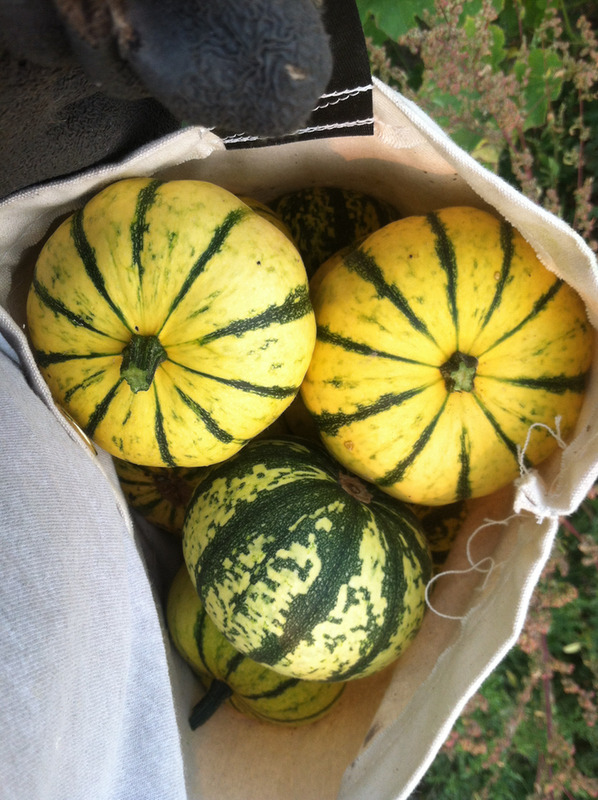 I am sure that I have gathered at least fifteen squash from each hill, and this during the height of a drought that in my region wiped out the Jersey pumpkin harvest. I dry this pumpkin in order to reconstitute it as paste or puree for my ongoing recipe project in American Indian cookery. Frankly, dried pumpkin is practical, since it stores easily and does not take up much space. 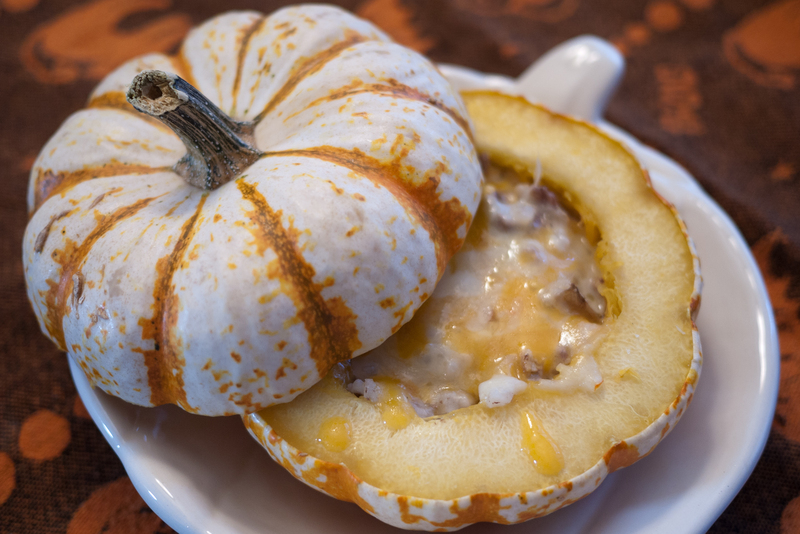 Otherwise, treat the mature fruit like acorn squash. Incidentally, the young fruit, when about 2 inches in diameter, may be sliced and served raw with dips or cooked like the small Ronde de Nice zucchini.